Our lovely cottages are to be found on our 2 acres of land with open countryside all around us, which means there is always lots of wildlife to hear and see. The summer brings such a great range of butterflies and also dragonflies to the garden. We are a short drive away from the Loire river and its many stunning towns and villages, such as Saumur, Chinon, Bourgeuil, Montsoreau, Villandry, Chenonceau, Amboise, Fontevraud Abbey to name but a few - what an ideal location to explore one of the prettiest and most stunning parts of the world! We have 2 charming holiday rental cottages for you to enjoy, each have their own individual charm and private space to relax. Our Fleur de Lys Cottage has 2 bedrooms and can sleep up to 4 people. Our Coquelicot Cottage has one bedroom and sleeps 2 people. We would be delighted if your party of 6 would like to visit. Each cottage has been lovingly restored to a high standard that combines both character and comfort - we are confident that you will leave feeling relaxed and recharged. We have got a pool so you can relax and cool down on those hot summer days. Classic Grand Prix car race in Puy De Notre Dame is a great spectacular also late July. The vines are ripe for harvest some time September through to October, many fairs and occasions occur throughout the spring, summer and autumn. Don't miss your opportunity to take home some great memories. We are Carol & Carl Mills and are from the UK. One of the first things we did when we first met, was to go on holiday to the Loire Valley. We fell in love with this wonderful part of France, as well as with each other. We loved the region so much, we decided to buy our French home in the Loire Valley. We called it Notre Petit Coin, ‘our Little Corner’ of France. We really love sharing our little secret corner of the Loire and allowing our special guests to explore the many exciting sides to the Loire region. When we found Notre Petit Coin, we were swept away with the setting, the open space, the lovely character houses, the peacefulness, yet we were still close to some lovely main towns. On top of that, we were in the middle of the Loire Valley with all its wonderful attractions and beauty. We love the pace of life, the choice we have each day - whether to stay at home, go out for a bike ride, discover some new vineyards, watch the Le Mans 24 hour car racing, visit another chateau, go shopping, watch the Cadre Noir horses in Saumur, have a long lunch in one of the many restaurants or a picnic in the sunshine or stroll alongside the Loire River ..... We know you are going to be delighted too. We have taken time to prepare the cottages to ensure our guests can thoroughly enjoy their stay, relax, unwind, explore. You will find that we have worked hard to ensure you have luxurious standards, without losing the real character of such lovely properties. Our aim and vision is to ensure that our guests’ expectations are exceeded when they come to stay at Notre Petit Coin. So we have given a lot of thought and taken a lot of time preparing our homes in readiness for you to discover our little corner of France too – we know you will be delighted and will go away feeling that you have had a relaxing and enjoyable time in such a wonderful part of the world. We look forward to welcoming you soon to Notre Petit Coin soon. Guests are welcome to use our washing machine for €3 per load. Private garden but feel free to wonder around our 2 acres of garden. Pause to watch the wildlife and enjoy the stunning views or listen to the peace. Thank you for your kind review. You certainly made the most of your stay and we’re able to see some of the nearby tourist attractions, experience the local supermarkets and restaurants as well as relax in the cottage and garden. We hope to welcome you again one day. Everything lived up to its description and more including the weather! Location was excellent for exploring this area of Loire. Hosts extremely helpful with places to visit routes to take and even car parks to use. Best thing we can say of our stay is that we will return. Thank you for your review. You had a very relaxing 2 weeks here despite it being very hot. You managed to find nice shade in the garden to keep cool as well as visiting the local ‘beach’ to swim and keep cool. You visited lots of the local tourist attractions and made the most of your time here. We look forward to welcoming you here again in the future. 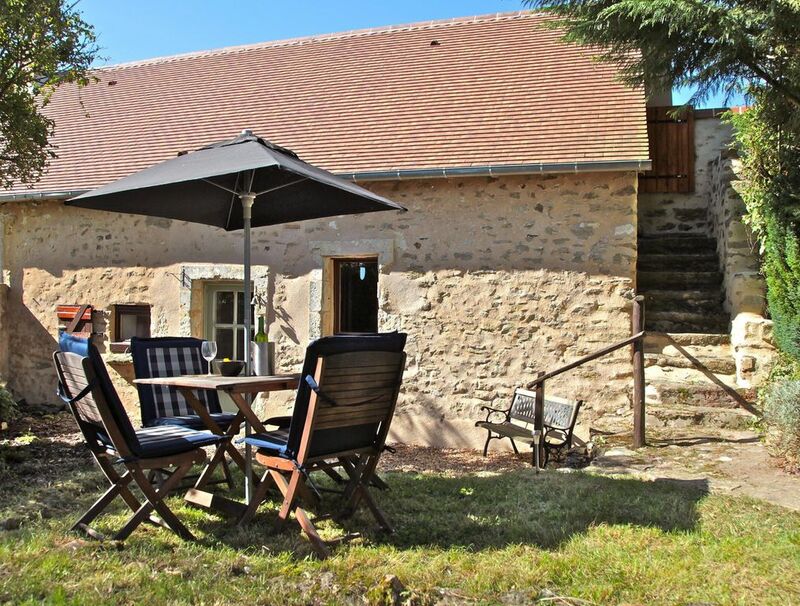 Delightful stone cottage in charming shady garden in a lane full of sunflowers and maize fields but not far from pretty villages and many chateaux. Thanks tor your review and we’re glad you had a nice time exploring and spending time with your daughter too. Hope to welcome you again soon. This gite building has obviously been renovated to a high standard maintaining its character features and has stunning kitchen facilities. The luxury in the gite for us was the dishwasher facility just like being at home. The lounge had everything one could need and there was plenty of hot water and a good pressure on the shower. It was spotlessly clean which was so comforting for our 2 week stay. Wi fi coverage we found to be very prompt and good. Outside there is private parking and garden area with seating and bbq and you have the opportunity to visit the other areas of the garden to have different views. We watched 2 muntjacs and a fox foraging in the newly harvested field next door one evening which was most interesting.The plunge pool was good and we welcomed it to cool us down as the temperatures increased. Carl and Carol were very good yet discreet hosts which we much appreciated. We enjoyed our stay here and would certainly recommend it. Thank you for your kind review. We’re pleased that you enjoyed staying here and that you found the cottage clean and you were comfortable and able to relax. We’re really pleased you enjoyed your stay and managed some great day trips in this lovely area, as well as relaxing in the garden and pool. We have just returned from a wonderful 10 day holiday at Fleur de lys cottage. We travelled with our young family on the Euro tunnel and found the drive pretty good and straightforward. When we arrived at the cottage we were wowed by how beautiful it was. Both the cottage and gardens exceeded all our expectations. Carol and Carl were very friendly and made us feel welcome as soon as we arrived. They gave us information on the local area which was a great help. We would certainly recommend a visit to Villandry Chateau and gardens and a trip to Saumur. Our favourite place was the beautiful beached lake at La Flèche which is the perfect spot on a hot a summers day. We spent lots of time enjoying the sun in gardens around the cottage, our young daughters loved the swimming pool, playing in the gardens and watching the cows in the next field! This was the most relaxing family holiday we've had. It was so peaceful staying in the countryside, but being only a short drive from supermarkets, patisseries etc meant we could enjoy an easy home from home holiday which included lots of bbqs. Our daughters loved their first adventure to France and want to come back again! Thank you for a really lovely holiday, we just wish we were still there! Thank you so much for your kind review. You were such a lovely family and it was so nice to see you all enjoying yourselves - in the pool, in the garden, playing boules, relaxing outside. You liked going to the beach in La Flèche too and Super U too! We're very happy that this was such a special holiday for you and your lovely family. Please come back soon.